Waiouru: A long day…… For us! A long day…… For us! 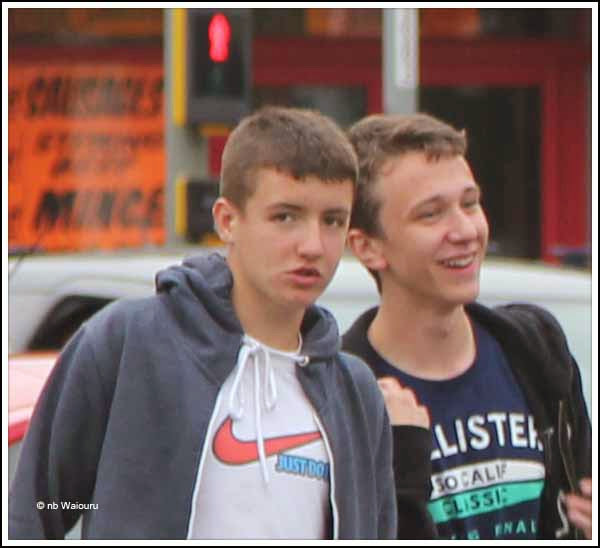 But first, these are two of the six Sandiacre youths who managed to amuse their undeveloped minds by pestering us, and the boat ahead, yesterday evening. Any boaters intending to cruise the Erewash Canal mooring at Sandiacre might find it prudent to moor on the non towpath side. It’s closer to the road but there is much less foot traffic. Second gripe for the day. Damned pharmacist at long Eaton sold me medication to stop my nose running. I’ve been taking the stuff for two days and my nose got worse. Jan looked at the packet late today and told me it was to loosen a blocked nose. I’ve been torturing myself! The bloody pharmacist even looked at the packet and told me it dried a runny nose <grrrrrr>. 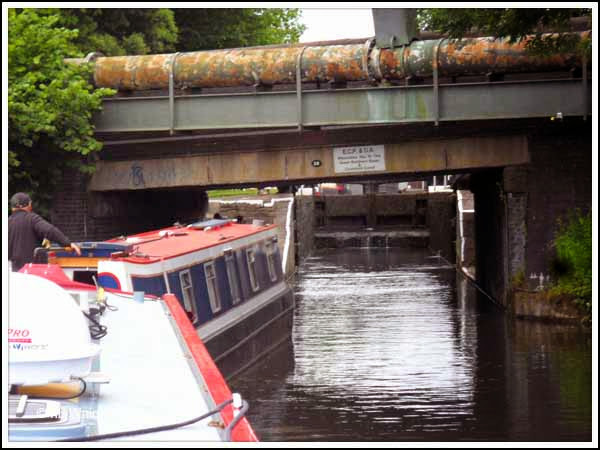 Well it was a long day’s cruise (for us) but we eventually reached Langley Mill at the navigable head of the canal. We paired up with Ian & Julie who have a mooring in Brinklow. Like us; it was their first time up the Erewash. And like us; it will be their last! We actually didn’t travel that far but almost all of it was at tick-over (or less) which made it a six hour day. 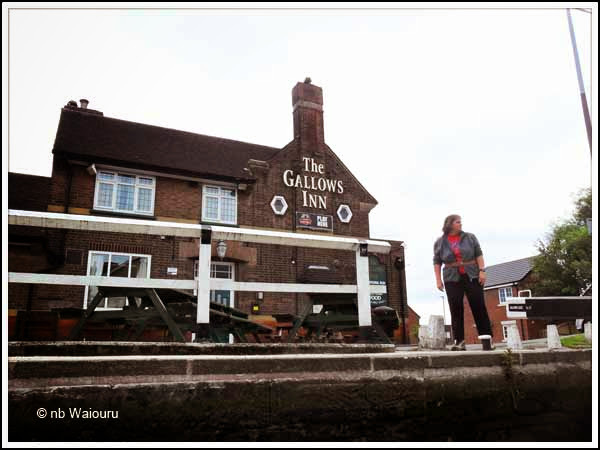 The fourth of the eleven locks today was Gallows Inn Lock. Doing the locks as a ‘pair’ certainly makes things easier. Both Jan and Julie mentioned the pub. But we’ve another seven locks to do today! Everyone started to get hungry by the time we’d reached Potters Lock. Well it was 1.30pm! Not having seen another boater in two days we decided to get cunning and stay in the lock together to have lunch. It was a great idea. Until a Canaltime boat came around the corner forcing us to cut short a hasty lunch. Shortly thereafter a second boat passed us going in the opposite direction. Three boats in two days…… Wow spoilt! At least it meant there would be two vacant moorings at the head of the navigation. 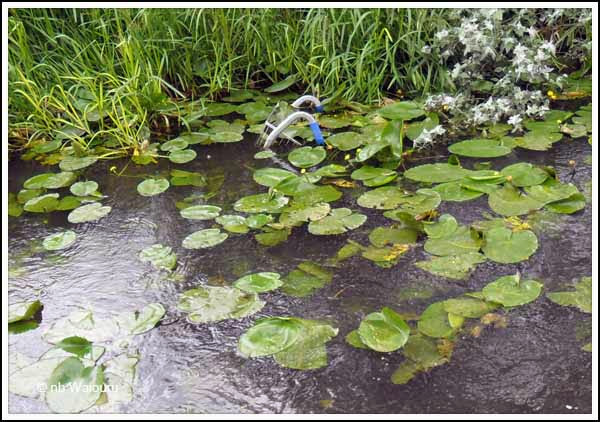 The Erewash is very shallow in places and the entire canal is almost choked with weed. Actually the canal is so shallow you can’t drown a Tesco trolley in it. Just as I was thinking it couldn’t get much worse we hit the pound between Stensons and Shipley locks. It took me almost an hour to do under a mile with Waiouru struggling to make headway along the bottom. Applying too many rev’s just dug the stern into the canal bed and churned up mud, weed and urban jellyfish (plastic bags). I got the rev’s down to the point where the propeller was just rotating and we slithered like a snail up the pound. 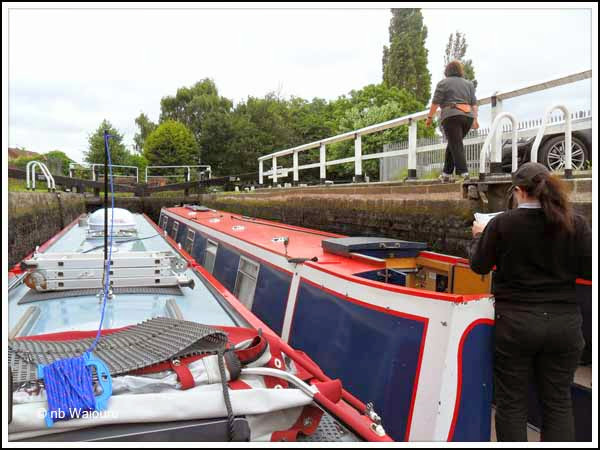 Hopefully the trip back will be slightly easier as we will release a lock full of water on the way down. The entrance into Langley Mill Basin isn’t very salubrious. Many of the bridges don’t provide much clearance and at one point I was worried the sat-dome on the roof might not make it. 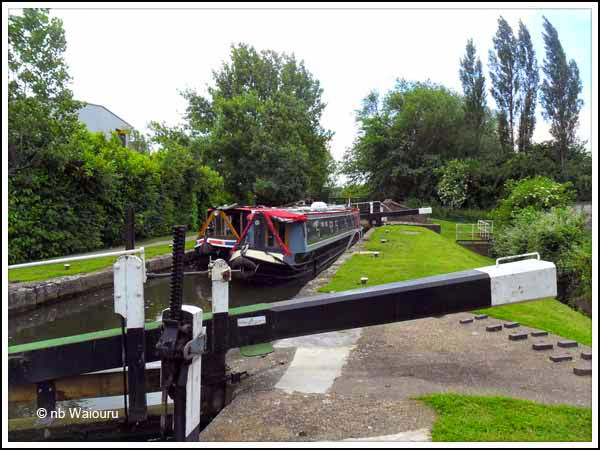 Ian & Julie waited in Langley Mill Lock whilst Jan and I winded (turned) Waiouru mooring on the water point (which is also a signed 7 day mooring). They then winded and moored opposite. The basin has very few visitor moorings but quite a number of long term moorings. Actually I’d be surprised if many of the long term moored boats ever moved! The basin has a water point and toilet. There is also what I’ve assumed to be a self-pumpout machine. 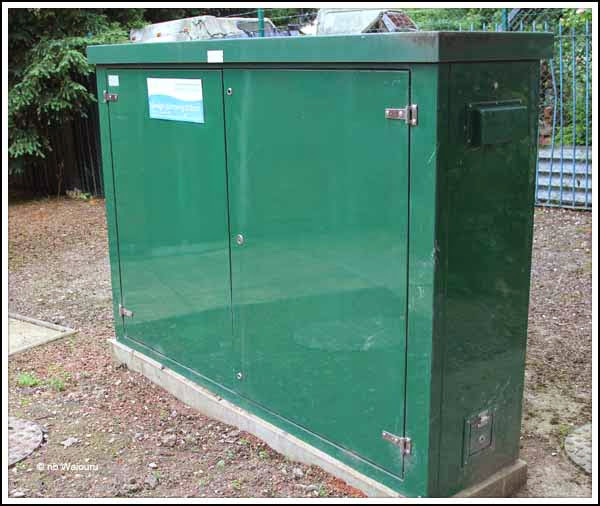 I’ve yet to find a CRT rubbish disposal facility and tomorrow I’ll visit the Langley Mill Boatyard to find out what services they provide. The plan is to spend tomorrow resting and then start heading back on Friday. Hopefully with a dry nose! Don't forget to get your plaque I think from the boat yard (£5) toprove you did it. When we were up there in 2011 the depth was very good and the weed not a problem. Hope your trip back is better than the one up, Enjoy. The plaque is on the list of jobs to be completed tomorrow. Amazing so much can have changed since you cruised the canal in 2011. 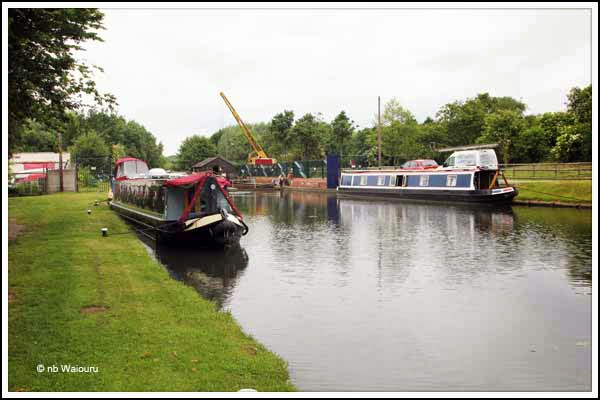 Don't know about 2011, but we had few problems on the Erewash in April, just three months ago. No weed (just two trips down the hatch to remove rubbish), plenty of depth, and no bandits. It was extremely cold though! 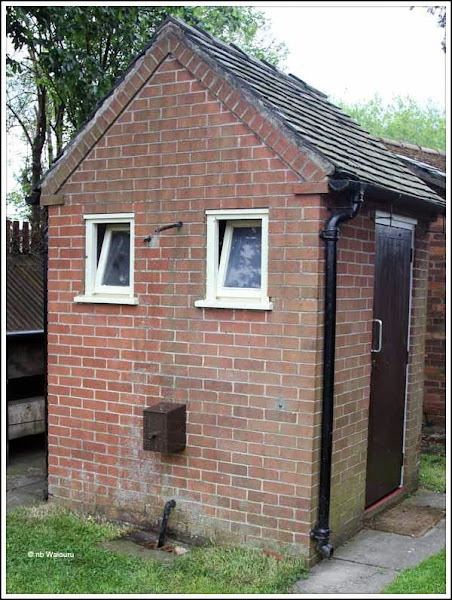 Mind you, I found no visitor moorings in the basin, and didn't see the loo block. Hope the nose clears up. Well I bounced over something large and hard in one bridge hole. It "bucked" Waiouru's stern into the air. The weed must have gone berserk in the last 3 months because it's quite bad! An interesting trip but we won't be doing it a 2nd time! Did you know there is a 'trolley app' available, enableing you to report dumped trollies wherever you find them? The recovery company then come out and recover them, amazingly enough!! 5th Share may be available! Do you understand the logic? Looks like we’re being stalked!